In fact I am not in the world, but the world is in me. The process of “reading” the external reality as internal is divided into four stages and immediately at the first step I should be guided only by what I see. And I see that the Creator is making this “projection” for me. It’s as if a projector is placed in me and it shows the whole world and all that happens to it. The light from the “bulb” of this “projector” passes through the “film,” divided into “frames,” and falls on the “screen,” i.e., in my mind; as a result, I see a current picture of the world. Well, the Creator Himself is the abstract Upper Light, the Light of Infinity. 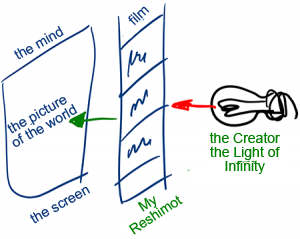 So, in fact, the “film” is my Reshimot that create this or that picture for me. And if it were not for this mechanism, I would have not distinguished what is happening because the Reshimot would have remained inside. However, the Creator, illuminating them, reveals my inner world as an external reality. Who Is Projecting The Movie Of Our Life? When addressing a wide audience, what we give is not speculation but facts about the integral world, about a single system, which is being eaten away by the cancerous tumor of egoism. The world, as well as the living body, needs balance, which is a sign of health and fulfilling life. Listeners should be turned into partners working on the material being taught. We do not oppose their beliefs but involve them initially to a rethinking about the world. Together with them, we see the world and understand how we live and function. And then of course, we understand that our future existence can be built only on equilibrium and the one who upsets balance, destroys and undermines the general system, until he dies, like cancer killing the body or humanity that is ruining nature. People do not see how they could live differently and we agree with them that the exit is nowhere in sight. And yet we point them at the ideal, universal law of equilibrium because the world is headed for disaster. In fact, we start talking not about unity but about the current situation: Today we live in a “bubble,” in some “field,” subject to the laws of equilibrium. And we do not match them. From generation to generation, we are becoming greater egoists and see this inevitable trend even in our own children, and that is why our problems are becoming more acute like during the development of metastasizing cancer. In the end, we state the facts, nothing more. And if these facts can be revealed a little, in small doses, people will internalize them and agree with us. This is the first stage of the explanation: I seemingly accompany my listeners on the path of the initial knowledge and awareness, and we become more united. Together, we look at the world and the crisis that it is experiencing in all areas. Indeed, humanity is in a tragic situation, but still we do not see it yet. Even in an individual family it is not easy to establish relations that have been soured, and on a global scale, no one even dreams of unraveling the tangle of all of humanity. Although ideally, the world needs unity, today we see more clearly that unity is a dream of romantics or fools. It is all correct because by nature we are opposite to the outer Nature, and thus in principle, are doomed to extinction. In fact, behind the illusion of life, we are approaching death second by second. So perhaps, we should agree with it and quietly live our days? Should we impose a new philosophy in society, a new view of what is happening and put up with this? Even today, people do not want to have children, so let our generation become the last on earth? Here, we take people to the “loophole,” to the unused opportunity. A special force acts in external integral Nature, and if we are together, the group somehow becomes similar to it, then something from Nature—its integral potential—will be manifested in this group. And then our group becomes connected with nature as one. Everything outside and inside seems to be filled with integral force. After all, all ills, all problems, are ultimately caused by a huge difference (Δ) between us and Nature. And accordingly, if we eliminate this difference, we will not simply become liberated but will become eternal and perfect like all of Nature. Even physicists confirm that this is possible. 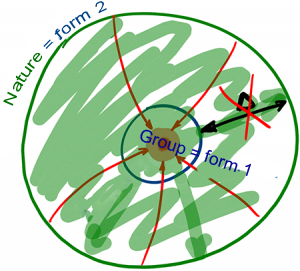 And the key is that the group, according to its properties (form 1), would be consistent with Nature (form 2). By drawing closer to each other, we become like it. How can we make the first form equal to the second? How can we get close? “Very simply, let’s try, organize a workshop, and you will feel this.” The main thing is the questions and discussion help people become closer, excite them, and promote agreement instead of arguments. And then the warmth of unity will envelop them, common feelings, around which they will begin to unite. It will take 20 to 30 minutes, and they will be imbued with a new spirit, as if their frequencies match. This will be the first example for them of what can be found in unity. This force is in Nature, but you need to connect to feel it, and then it will correct everyone’s flaws and problems in all areas of their lives. A Million Dollars Or The Upper Light? Question: Is it worthwhile for me to talk about what we are doing with integral education at my workplace? Answer: No, at work, it is better not to engage in dissemination activities. It is better that some stranger come to your workplace, for example, your friend from the group, that nobody knows this is linked to you, that you don’t have any relationship to this. There is a saying: “There is no prophet in his own country.” Usually if a person portrays himself at work as an expert in any area not related to their profession, then as a general rule, he isn’t taken seriously: “We know him. He grew up with us, we were in the same kindergarten, he went to school with us”; that is, you already don’t have the relationship to be a teacher. “There is no prophet in his own country.” A prophet must come from another place. What Does It Take to Be a Prophet? Is Europe Ready For Integration? When the upper descends to the lower, the lower feels it as darkness. This means that it hurts his ego. But if the lower wants to understand the upper and to know his intentions, despite the bad feeling, and if he doesn’t want to blame the upper but rather tries to justify Him, understanding that the upper operates only for the lower’s sake, the lower has to increase his awareness in order to justify the upper. The lower says that the AHP of the upper is revealed in him now and despite his bad feeling, he has to adhere to Him, which means not only to restrain himself and to kiss the beating stick of the upper, but also to accept this Providence gladly and willingly. This can be felt as troubles, problems, humiliations, disgrace, and any other surprises the Creator may prepare for a person. But I have to understand that it is all for my own good, that it hurts my ego, and that it is great! Let me suffer, my ego cannot raise its head now. So I don’t even ask the upper to understand and to get to know Him, but just a little awareness to the extent that I can relate to Him properly. This means that I want to understand and to feel His actions in order to imitate Him. Here we are given a chance to develop our awareness, just like a child’s mind that tries to understand his mother. He thinks that his mother treats him badly, but he understands that it cannot be! Here the group and all the other means can a help a person reach this demand. When we go out to disseminate, we prepare ourselves for the blows, which is the “sorrow of raising sons.” But we have to justify them since the lower doesn’t understand and cannot operate any differently. We have to raise their deficiencies to the upper upper (to the group and further up) and to correct their attitude. Our prayer will be double: The upper that raises the request of the lower upwards is rewarded twice so that he will become great and will give birth to the lower. So first we have to ask the uppermost for the power not to neglect the lower, not to disrespect them and hate them, but rather to love them in spite of their disdain and accusations. Despite all this, we should ask for the power to be great and to treat them with love, bestowal, and dedication and to take care of them devotedly in order to bring them the part of the Light that they need. We do all that not so that they will curse us or accept our actions but only so that they will grow to the delight of the Creator! Then this whole process becomes in order to bestow. How Can Truth Grow From A Double Lie? Question: If a person has not yet realized himself in a group, still hasn’t acquired an intention in order to bestow, how can he turn to the general public to take care of it and be concerned for it? Answer: Here is the whole point of the group, at the forefront for us. First of all we build it. And we go out to the general public provided that, above all, it helps the group. As long as I have not accepted the right form within the group, I don’t have any reason to go out to the masses. Even today, our massive external dissemination means that we feel an even greater need for uniting internally. Also, children who are born into a family give greater strength to the marital union; they give the parents the need and reason to continue to be together. And conversely, couples without children divorce more easily, without a feeling of belonging to each other; they see no reason to continue to be together. Therefore, in that we are concerned for the external public, first of all we maintain the consolidation and unity of the friends. And then in work with the general public we have a double benefit: First of all we are doing this according to the command of the Creator, second, through our constant consolidation in the group according to the requirements of external factors, we acquire the ability to receive inner strength from above. 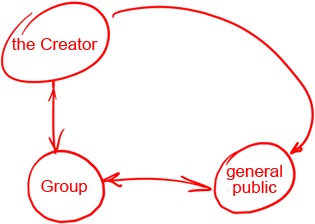 In a manner like this, the components of this triangle act mutually: the group, the external public, and the Creator. And the Creator acts on us through the general public. And that is how it is until everything becomes one. What Does Defeating The Creator Mean? Question: What does “My sons have defeated Me” mean if we never ascend above the Creator? Answer: “My sons have defeated Me” means that they have defeated all the hardships, they have overcome all the difficulties the Creator has given them. In the situation of the guest and the host, I not only defeat the Creator, but I also use Him. The victory is not in defeating and silencing Him, but rather in using Him, in receiving from Him all the love and bestowal that He stimulates in me now on top of the shame that I begin to feel. First I was ashamed that I might be caught as if I have stolen something. Then it turned out that I am not a thief but that I have taken a gift that belongs to me, that the Host has given me out of His great love to me. This already provokes two types of feelings in me—Bina and Malchut. The feeling of the Host is the beginning of Bina, without this the created being cannot exist. The feeling of Malchut is the same since I want to receive, but if I feel the love of the host and the shame inside Malchut I have to calculate how to raise Bina above Malchut. But if I raise Bina above Malchut so I will not feel the shame and receive the pleasure, it is already a shell, since Bina begins to serve Malchut. On the other hand, if I use Malchut with its desire to enjoy together with the feeling of shame and want to fulfill the desire of Bina, Malchut rises to Bina bringing its Aviut (thickness) to Bina, the force of its desire. As a result, Bina expands and grows stronger. With the help of the force that helps Bina, the level of Moses develops, I try to reach the state of Keter, adhesion, and then I begin to correct Malchut. Question: What is the Reflected Light? How can the Light come from below, upward? Answer: Talmud Eser Sefirot, part 2, “Histaklut Pnimit,” Item 19: A new Ohr was generated by the above encounter and Haka’a. Like sunlight on a mirror, meaning on a glass that is painted on the other side, the rays of the sun cannot pass through the mirror because of the paint on the other side. Consequently, the sun rays return backward and produce solar light. In much the same way, when the Ohr Elyon meets the force of the Tzimtzum in Behina Dalet, called Masach, this Masach turns it back to its Shoresh. However, in this case, there is no issue of concealment. On the contrary, the return of the Ohr Elyon from Behina Dalet upwards is regarded as a new and special Ohr. It mounts the Ohr Elyon, clothes it and holds it within. Because of that, it is regarded as a Kli that receives the Ohr Elyon. The Reflected Light is my desire to respond to the one who created me. It is as if there is a doll made from clay that suddenly begins to sense that someone is sculpting her. This creator of her gave her such sensations that she could feel him, his kind hands that are sculpting her. The feelings that fulfill her inside make her want to respond to him with gratefulness, through the touch of his fingers, through his gentle attitude. This light gratefulness is the Reflected Light. Question: I understand that on top of my will to receive I build the intention to bestow to my friends, but how do I know if I ascribe the same intention to the Creator? Answer: On one hand there is a desire to receive pleasure, and on the other hand, there is the Light, the Creator. Both have to be connected as one. And in order to bring them to unity, a system was created: family, society, this world, and the upper worlds, the whole Universe, all that exists. But in face, this process involves only two: the desire to receive and desire to bestow. In order to tie them together and bring unity between them, all the medium through which they should connect were built. There is a person on one side, and there is the Creator on the other. In the middle, there is a family, the society, the group, humanity, history and the whole system of upper worlds and their actions. All that is between them is in order to connect them with each other. If a person wants to become connected with the Creator, then the only opportunity to test himself is through the group, meaning, through the worlds that exist between him and the Creator. Only by that can they connect.